Epithelial ingrowth or other problems from LASIK? File a MedWatch report with the FDA online. Alternatively, you may call FDA at 1-800-FDA-1088 to report by telephone, download the paper form and either fax it to 1-800-FDA-0178 or mail it to the address shown at the bottom of page 3, or download the MedWatcher Mobile App for reporting LASIK problems to the FDA using a smart phone or tablet. Read a sample of LASIK injury reports currently on file with the FDA. Reported treatments for epithelial ingrowth. Quote: "Techniques for removal include scraping of epithelial ingrowth and excimer laser phototherapeutic keratectomy (PTK). The flap is reflected and the ingrowth is removed by peeling off as a sheet using fine forceps or by scraping from both the stromal bed as well as the undersurface of the flap. The bed is then irrigated well before replacing the flap. Excimer laser PTK may also be used to remove the epithelial cells. Adjuncts, such as cryotherapy, Nd:YAG laser, mitomycin C and sutures, may lead to a decreased incidence of recurrence. Some authors have reported success with ethanol and laser therapy for recurrences. The major problem in the management of epithelial ingrowth is the high incidence of recurrence after treatment. Recurrence of epithelial ingrowth after treatment has been reported to be as high as 44%." End quote. (Source: Amar Agarwal, MS, FRCS, FRCOphth. Tips for preventing and treating epithelial ingrowth after LASIK. Ocular Surgery News U.S. Edition, October 1, 2006). Editor's note: The webmaster of this site does not endorse these treatments. Epithelial ingrowth images below courtesy of Dr. Edward Boshnick. This eye in the photo below underwent 2 separate RK surgeries followed by 2 separate LASIK procedures. 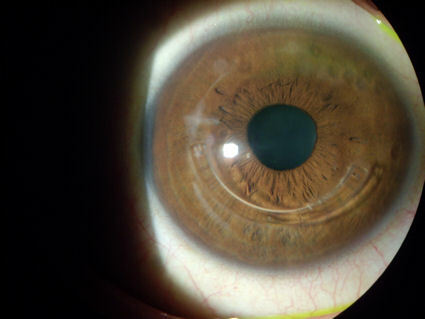 This patient's last LASIK surgery was done in 2004. In 2013, a large colony of epithelial cells was discovered under the LASIK flap of her left eye. One year later this grouping of epithelial cells broke up and migrated to the central area of the cornea beneath the LASIK flap. 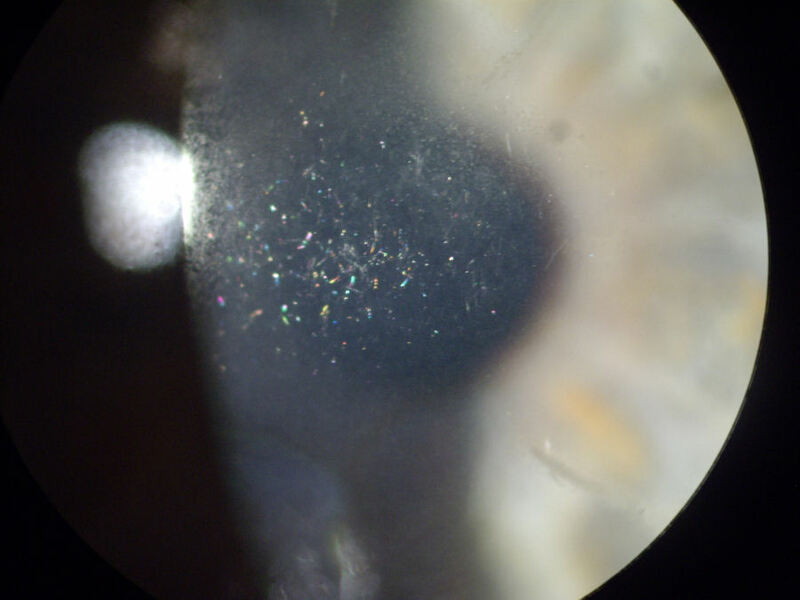 The “glitter-like” appearance seen in this photo is actually epithelial cells that have migrated from the corneal surface to areas beneath the LASIK flap. A corneal specialist at a world famous eye institution declined recently to lift the LASIK flap to remove what is now cellular debris beneath the LASIK flap. (The bright white light seen in the left side of the photo is a reflection of the bulb in the microscope.) Click image to enlarge. The photo below is an eye with post-LASIK epithelial ingrowth, which appears as a speckled white patch at the 7:00 position on the cornea. The patient had LASIK, followed by LASIK reoperation (enhancement), and subsequently developed epithelial ingrowth. It is common knowledge within the LASIK industry that LASIK reoperations carry a higher risk of epithelial ingrowth than primary LASIK. 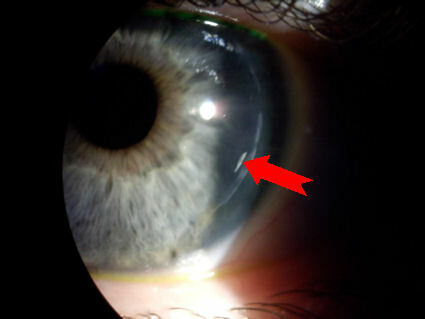 Patients who consent to LASIK reoperations should be warned of the increased risk of developing this potentially sight-threatening complication. This patient had corrective surgery to remove the epithelial ingrowth, which involved lifting the flap; however, the epithelial ingrowth returned. Click image to enlarge. 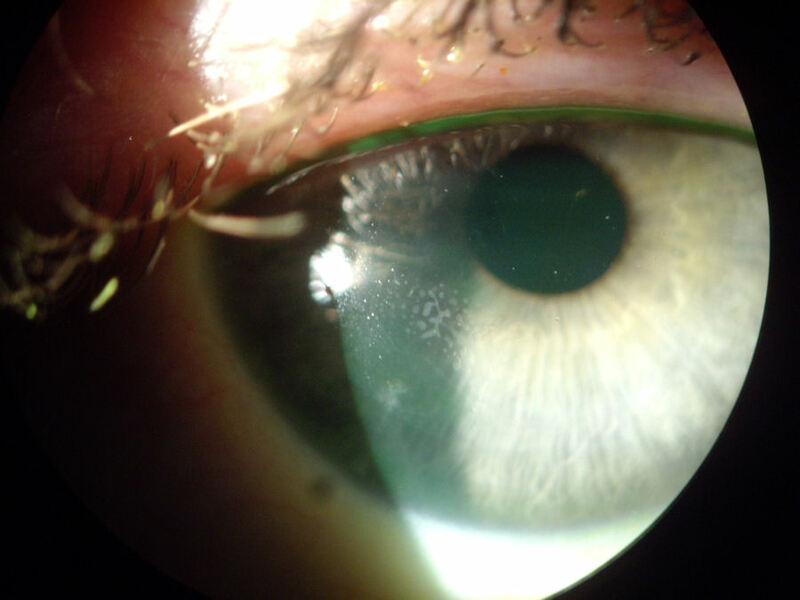 The photo below is a post-LASIK cornea with epithelial ingrowth and ectasia. The foreign object located in the perimeter of the cornea is an implantable plastic insert called INTACS, which was implanted in an attempt to flatten the ectasia protrusion. 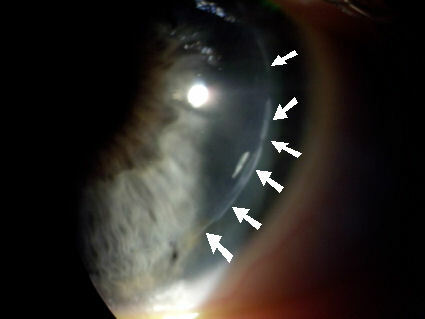 The t-shaped hazy white scar at the 9:00 position is from the incision which was made to insert the Intacs into the cornea. The milky line running from 7:00 to 8:00 is epithelial ingrowth. Click image to enlarge. The photo below is the cornea of a patient who had LASIK in 2007. This cornea is extremely dry and irregularly shaped. In addition, epithelial cells from the outside surface of the cornea penetrated and grew under the LASIK flap. The cells can be seen as a white line extending from the lower cornea at 5:00 o'clock to 8:00 o'clock. The patient is wearing a specialty gas permeable scleral lens to protect the traumatized corneal tissue. Click image to enlarge. The photo below is the cornea of a patient who had LASIK in Canada in 2009 and developed severe epithelial ingrowth. You can see the area of epithelial ingrowth from the 5:00 to 8:00 o'clock position. Cells from the outer layer of the cornea migrated underneath the LASIK flap. At this time it is not known if the cells will continue to proliferate under the flap. This cornea is extremely dry and irregularly shaped. The patient complains of foreign body sensation, sandy-gritty feeling, and constant burning. Patient also complains of distorted vision including starbursts, halos and glare. The epithelial ingrowth is easy to see, yet the LASIK surgeon who performed this surgery told the patient that there is nothing unusual about this eye, and that he cannot tell that the patient has had LASIK. Click image to enlarge. The photo below is the cornea of a patient who has epithelial ingrowth following RK, RK enhancement, LASIK, and LASIK enhancement. The red arrow points to an RK incision that is still open. 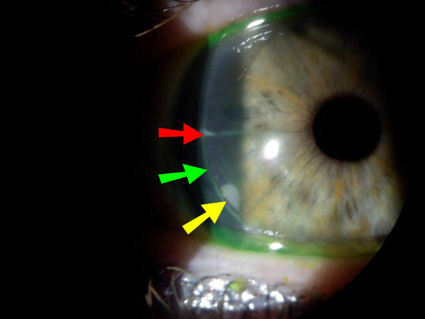 The green arrow points to the LASIK flap edge, which is not healed. The yellow arrow points to the pocket of epithelial ingrowth, which is a potentially sight-threatening complication. The patient has constant pain in addition to extremely blurred and distorted vision. The two images below are photographs of the left eye of a professional baseball player who underwent LASIK surgery and subsequently developed epithelial ingrowth. In the top photograph, the red arrow points to a nest of epithelial cells in the interface between the flap and the underlying cornea. In the bottom image, white arrows point to epithelial cells growing under the flap along the flap margin. This patient has epithelial ingrowth in both eyes. Due to this condition he is unable to see well enough to hit the ball during night-time baseball games. The next image is a scan taken by Dr. Edward Boshnick of a post-LASIK cornea with epithelial ingrowth. This image was acquired with a Visante OCT anterior segment imaging scanner. This technology has many applications in diagnosing and treating patients with corneal disease or problems after refractive surgery. Click on image for a larger view. The clinic reported that a laser vision correction patient was treated for a lift flap enhancement in the left eye and returned at one week post op reporting a vision change and double vision in the left eye. The patient's visual acuity was 20/25 in the left eye. 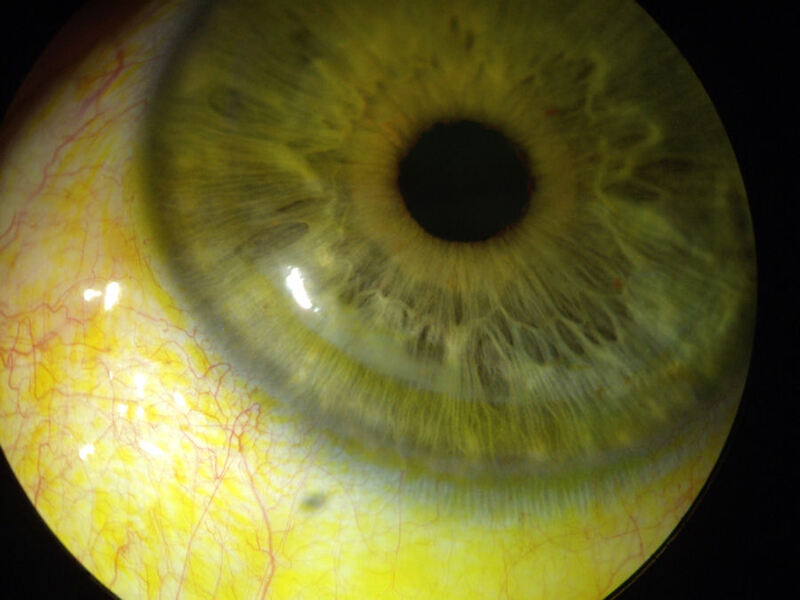 A slit lamp evaluation diagnosed an epithelial in-growth from 4-6 o'clock position. The patient was brought into the laser suite and the flap was lifted and the epithelial in-growth was removed. The patient was examined the next day and the patient's visual acuity was 20/20 in the left eye. The patient was fitted with a bandage contact lens which was removed after three days. The clinic reported that a pt treated for a laser vision enhancement procedure approx 4 years earlier presented with an epithelial ingrowth in the right eye. The epithelial ingrowth was removed on [redacted] 2011. The pt returned on [redacted] 2011 for a f/u examine due to experiencing blurriness in their right eye. The pt was diagnosed with a recurring epithelial ingrowth. The surgeon lifted the flap and removed the ingrowth. This is a recurring event for this pt and a similar event was reported on [redacted] 2011 in Medwatch 3006695864-2011-00058. The surface layer of the cornea is the epithelium. If damaged, epithelial cells regenerate. Below the epithelium is the corneal stroma. The blade that cuts the LASIK flap penetrates to approximately one-third of the thickness of the corneal stroma. Where the flap meets the corneal bed is called the interface. Epithelial cells may be implanted in the interface either during flap creation or may migrate under the flap after surgery. Epithelial ingrowth is the term for cells growing under the LASIK flap. A medical study of postmortem corneas after "successful" LASIK found that epithelial ingrowth of varying degrees occurrs in 47% of corneas (see abstract below). The risk of epithelial ingrowth is greater for reoperations involving lifting the flap. Mild cases of epithelial ingrowth outside the pupil area may not have a detrimental affect on vision. However, epithelial ingrowth that encroaches the field of vision may result in visual impairment. Surgical intervention is required in some cases. A high recurrence of epithelial ingrowth is reported after surgical intervention. Epithelial ingrowth may lead to flap melt and severe vision loss. Post-laser assisted in situ keratomileusis epithelial ingrowth and its relation to pretreatment refractive error. Mohamed TA, Hoffman RS, Fine IH, Packer M.
PURPOSE: To assess the incidence of epithelial ingrowth after laser in situ keratomileusis and its correlation with myopic or hyperopic treatment. METHODS: This retrospective study analyzed 1000 consecutive LASIK procedures performed by 3 surgeons using identical surgical technique with a Hansatome microkeratome. Eyes that developed epithelial ingrowth were evaluated using the Machat grading system. Patients were subdivided into 2 groups (myopic or hyperopic) based on the preoperative refractive error. RESULTS: The total incidence of epithelial ingrowth was 4.7%. The incidence after primary treatment was 3.9%. The incidence after enhancement was 12.8%. The total incidence of epithelial ingrowth was 3% in the myopic group compared with 23% in the hyperopic group. After primary myopic treatment, there was a 3% incidence of epithelial ingrowth compared with 17% after primary hyperopic treatment. The incidence after enhancement was 7% in the myopic group and 43% in the hyperopic group. CONCLUSIONS: Patients undergoing hyperopic laser in situ keratomileusis have a greater incidence of epithelial ingrowth than those undergoing myopic treatment. In addition, enhancement procedures have a higher incidence than primary procedures. Management of Epithelial Ingrowth After Laser In Situ Keratomileusis on a Tertiary Care Cornea Service. PURPOSE:: To review the management of epithelial ingrowth after laser in situ keratomileusis (LASIK) on the Wills Eye Institute Cornea Service from 1996 through 2007. METHODS:: Data of all patients referred to the Wills Eye Cornea Service after having undergone LASIK were reviewed. Charts of all patients with the diagnosis of epithelial ingrowth were analyzed. Data included patient demographics, previous ocular history, visual acuity, size and location of the ingrowth, and management. Additional data on eyes that underwent removal of the ingrowth at Wills were obtained. RESULTS:: Three hundred five patients (153 female and 152 male, mean age: 44.7 years) were referred for eye problems after LASIK during the study period. Epithelial ingrowth was confirmed in 46 patients (15%) (19 female and 27 male, mean age: 47.4 years) involving 55 eyes (27 right and 28 left). 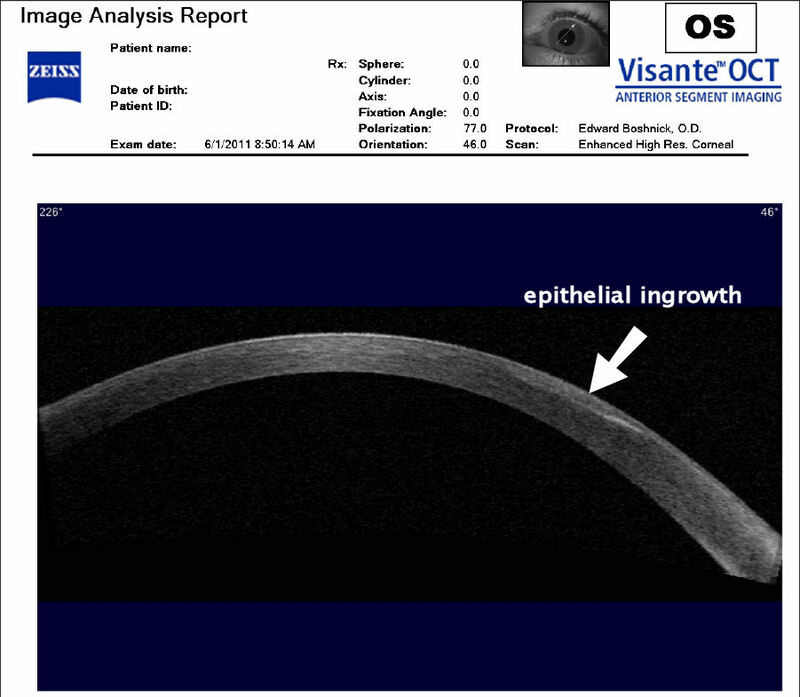 Patients with epithelial ingrowth were seen at a mean of 26 months after LASIK (range: 0.5-108 months). Twenty-four eyes had undergone previous enhancements, 2 twice. Fourteen eyes had undergone previous removal of epithelial ingrowth, 8 more than once (range: 2-8). In 35 eyes, simple observation was recommended. In 7 eyes, epithelial removal was recommended to the referring physician. Thirteen eyes underwent flap lift and epithelial removal at Wills Eye; 9 included flap suturing. One eye required repeat treatment with flap suturing and fibrin glue, after which no recurrence was found. In the other 12 eyes, there was no recurrence in 9, small recurrences in 2, and a large recurrence in 1 eye (mean follow-up: 16 months). CONCLUSIONS:: Epithelial ingrowth after LASIK is not rare in our referral practice. Mild ingrowth can be observed, whereas significant ingrowth can respond well to removal with a low chance of significant recurrence. "Epithelial ingrowth is a relatively common complication of LASIK. 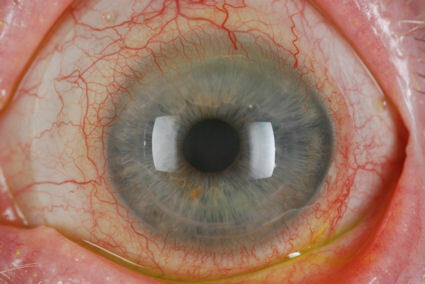 The risk factors for its development include epithelial defects at the time of or soon after surgery, epithelial basement membrane dystrophy, hyperopic LASIK corrections, repeated LASIK surgery, flap instability, presence of diffuse lamellar keratitis (DLK), and a history of epithelial ingrowth in the fellow eye. While the reported incidence is up to 20%, less than 1% of cases required treatment in 2 large reported series. Most patients with epithelial ingrowth are asymptomatic but have subtle findings on examination. Fluorescein staining can often be seen at the flap edge in the area of the ingrowth, as there usually is incomplete adhesion of the flap to the underlying stroma. Epithelial ingrowth probably occurs postoperatively with an invasion of epithelial cells under the flap. Another possibility is that implantation of epithelial cells in the interface intraoperatively leads to epithelial ingrowth. In most cases, there is continuity between the epithelium in the interface and the surface epithelium with incomplete adhesion of the flap edge, suggesting that a postoperative invasion is the likely etiology." Source: J Cataract Refract Surg. 2004 Apr;30(4):929-31. Advanced epithelial ingrowth 6 months after laser in situ keratomileusis. Latkany RA, Haq FE, Speaker MG.
Late-onset epithelial ingrowth after laser in situ keratomileusis. J Cataract Refract Surg. 2009 Nov;35(11):2022-3. We report a case of late-onset epithelial ingrowth that occurred between 17 months and 20 months after an uneventful laser in situ keratomileusis (LASIK) enhancement. The patient denied a history of trauma or symptoms consistent with epithelial disruption. Post-LASIK treatment had included lifting the flap and scraping the epithelial cells followed by placement of corneal flap sutures for several weeks and a bandage contact lens for 3 days. Gradual regression of epithelial cells was noted. The last recorded uncorrected distance visual acuity 24 months after scraping was 20/25. Epithelial ingrowth can occur many months after LASIK even in the absence of predisposing factors such as trauma or recurrent erosion syndrome. From the full text: In the current study, we found that epithelial ingrowth occurred in 20 of 43 corneas (47%). Kymionis G, Ide T, Yoo S.
Bascom Palmer Eye Institute, University of Miami Miller School of Medicine, Miami University, Miami, FL - USA. PURPOSE. To report a patient with severe post-laser in situ keratomileusis (LASIK) epithelial ingrowth and keratolysis treated with flap amputation and phototherapeutic keratectomy (PTK) with adjuvant intraoperative mitomycin C (MMC). RESULTS. A 55-year-old woman was referred to our department due to severe post-LASIK epithelial ingrowth with corneal melting 2 years after primary LASIK. The patient had had two previous attempts for epithelial ingrowth treatment (flap lift and epithelial ingrowth manual removal) that were unsuccessful. Slit lamp biomicroscopy and anterior segment optical coherence tomography showed extensive epithelial ingrowth and keratolysis (thinning of the LASIK flap) while the patient had photophobia and could not tolerate contact lenses. Flap amputation with subsequent PTK (in order to smooth out the corneal irregularities caused by the keratolysis and/or variations in flap thickness) and adjuvant intraoperative MMC application for 2 minutes was performed. There were no intra- or postoperative adverse events seen during the follow-up period. Six months after the procedure, uncorrected visual acuity improved to 20/40 compared with 20/50 preoperatively, while best spectacle-corrected visual acuity improved from 20/40 to 20/32. The topographic astigmatism was decreased from 3.24 diopters (D) to 1.00 D.
CONCLUSIONS. Flap amputation with PTK and adjuvant intraoperative MMC is an option for the management of severe post-LASIK epithelial ingrowth with keratolysis.